Hundreds of Vietnamese hold a rare protest in Hanoi demanding China stay out of their country's waters Sunday, June 5, 2011. Tensions in the South China Sea over territorial disputes are rising once again with China clashing with Vietnam and the Philippines recently. The disputes come as the United States and ASEAN try to help those with claims in the resource rich waters resolve their differences through dialogue and avoid the use of force or threats. At a rare protest rally on Sunday in Vietnam, hundreds converged on the Chinese Embassy to blast Beijing for its recent alleged aggressions in the South China Sea. Vietnam says a Chinese vessel intentionally cut a submerged cable of a Vietnamese oil survey ship last month while it was conducting seismic tests. The Philippines has also reported renewed territorial disputes, accusing China of unloading building materials and putting up military posts on reefs claimed by Manila. China defends its actions and says they are completely justified. On Sunday, speaking at a regional defense forum in Singapore, China's Defense Minister Liang Guanglie claimed the recent flare ups with Vietnam and the Philippines were now under control. "There has always been freedom to navigate in the South China Sea. No one owns it. The overall situation in the area is stable," he said. Dean Cheng, an Asia defense analyst at the Heritage Foundation in Washington says while China may not be shooting anyone, it's actions are provocative and put lives in danger. “[China] seem[s] to be engaging in a broad-based push to lay claim to the entire region and they don’t seem to care whose toes they are stepping on," he said. The Association of Southeast Asian Nations or ASEAN has been working with China to reach an agreement on a code of conduct for the South China Sea. Speaking at the same conference on Sunday, Vietnam's Deputy Minister of Defense Ngyuen Chi Vinh says China's cooperation is crucial and adds Vietnam's resolve is firm. "The consistent unwavering position of our party and state is that we will use all means to protect our sovereignty," he said. 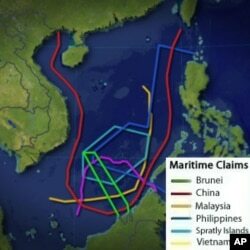 The South China Sea is a major shipping lane and is believed to be rich in oil and gas reserves. It is claimed by several countries including Brunei, Malaysia, China, the Philippines, and Vietnam. The United States has offered to facilitate territorial disputes between China and its Southeast Asian neighbors. Speaking in Washington last week, Assistant Secretary of State Kurt Campbell says the U.S. continues to promote dialogue between the disputing parties. “We discourage a resort to violence in these circumstances or threats and we want to see a process of dialogue emerge. We communicate intensively and privately with a variety of states associated with the South China Seas and I think we are going to continue to do that as we go forward," he said. China prefers to discuss disputes one on one with other claimants. And, until recently Beijing appeared to be easing off in its assertions of territorial claims in the South China Sea. Heritage Foundation analyst Dean Cheng says the recent uptick in tensions may be a sign Beijing is testing the waters with Vietnam or the United States. He points out China's actions follow a string of summits between China and the United States, including between President Hu Jintao and Barack Obama in January. “This may well be a test. To see - ok- we’ve had these summits, we’ve said that we want better relations: Are you going to jeopardize that promise of better relations now by interacting on behalf of the Southeast Asians or with the Southeast Asians over issues the Chinese feel is their territorial rights," he said. Cheng says the increase in tensions could also be related to China's upcoming leadership transition in 2012. Chinese President Hu Jintao steps down from office next year and Cheng says it could be that the incoming government and outgoing government feel they have no choice but to take a stand and make a point that this is China's territory. Over the past week, U.S. officials have stressed Washington's commitment to Asia, in particular Southeast Asia, and their willingness to work together with China in the region. China says it too is committed to peacefully resolving disputes in the region. However, from the streets of Hanoi, it appears that resolution may still be a long way off.